Rev. 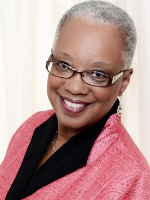 Shelley Stanley Smith specializes in clergy and leadership coaching. She received her training through the Coach Approach Skill Training, and is a member of the International Coaching Federation. Her coaching is enhanced by experience in the areas of Christian education, pastoral care, administration, youth ministry and persons with special needs. She facilitates coaching with individuals and groups, the Gateway South District of the Greater New Jersey United Methodist Church Conference, seminary students and other faith community leaders. Shelley serves as the Senior Pastor of Ferry Avenue UMC, Camden, NJ, and Circuit Leader for UM churches in Camden, NJ. Additionally, she is an adjunct professor with Eastern’s School of Christian Ministry, Palmer Theological Seminary of Eastern University, St. David, PA.
Shelley and Oliver have been married for over 37 years, have two sons and three grandchildren. Travel, genealogy, and Turner Classic Movies are a few of her favorite leisure activities.